Whilst the weighting is a step further on from success rates, helping to explain how a team’s, or player’s, shooting compares to the average, it is by no means complete. There are many elements to a shot that are omitted from its calculation but one important one, game situation, is tackled below. Even that simple statement is slightly misleading as the type of shot is hugely important. 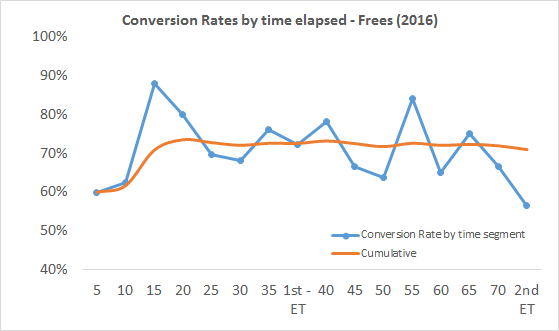 Shots from play are converted 45% of the time whilst attempts at goal from deadballs (frees, 45s in the main) are converted 67% of the time. Delving a bit further we know that where the shot is taken from is of huge importance. Dividing the pitch into 9 segments (see here for details) we can see that as expected the closer in to goal, and the more central the shot, the better. 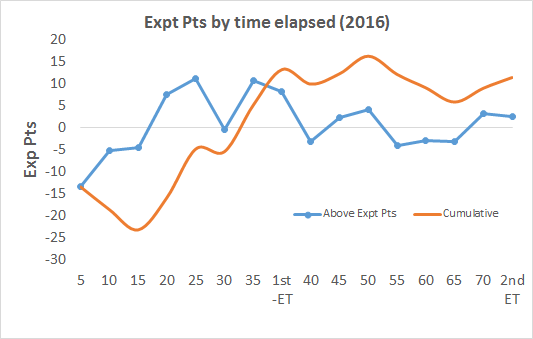 There have been tweaks along the way, notably separating frees from 45s and shots at goal from shots for points, but these two factors, shot type & shot position, have been the general thrust of the weighting since the blog began. We know that there are other elements to a shot’s success; pressure on the shot from the opposition, weather, quality of the opposing defence to name but a few. Another one is the game situation. There is definitely evidence of improved performance whilst shooting with a lead but it’s a mixed bag. The deadball striking was baffling at first. I couldn’t understand why it was that players would perform better from deadballs whilst chasing a lead. The answer came however when I looked at the type of shot being taken, Table 2 above shows us that the closer in to goal you are the more likely you are to score. Teams chasing the lead take 5% more of their shots from inside the 45m. 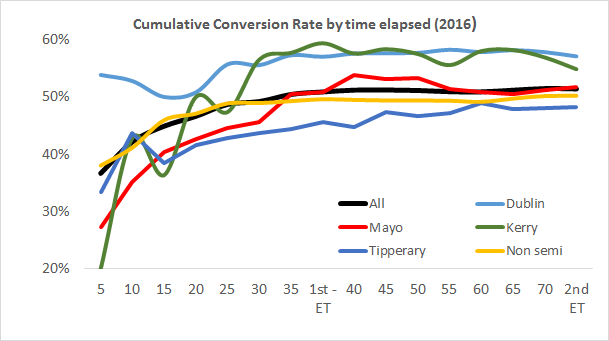 When protecting a lead are teams more willing to foul an opponent (Mayo V Dublin in last year’s semi final) or is this just normal variation that will even out over time? The volumes are relatively robust (in excess of 550 frees) which would suggest there is an element to the former. The difference in shooting from play is more pronounced and with a lot more data points. Also comparing the shots from play does not have, to the same extent, the issue of where the shots are coming from as in the deadball commentary above. Nearly 20% of all shots from deadballs come from outside the 45; only 2.5% of shots from play come from the same sectors. 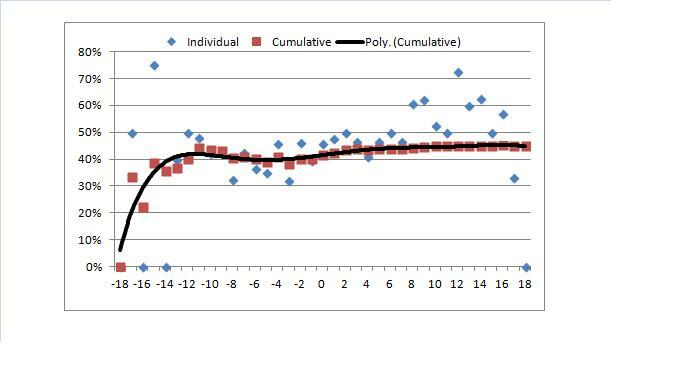 The below graph shows the returns from play for each game situation along with a cumulative return. 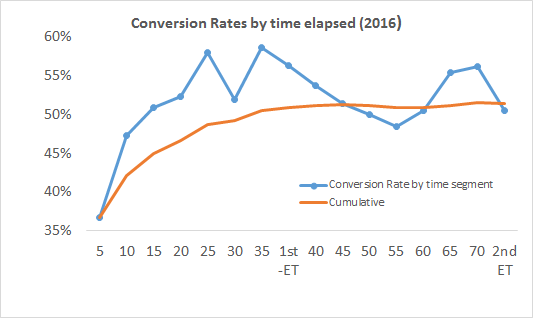 Looking at the cumulative return there appears to be an argument that the further ahead, or behind you are then the more magnified the effect. There’s quite a bit in this graph. 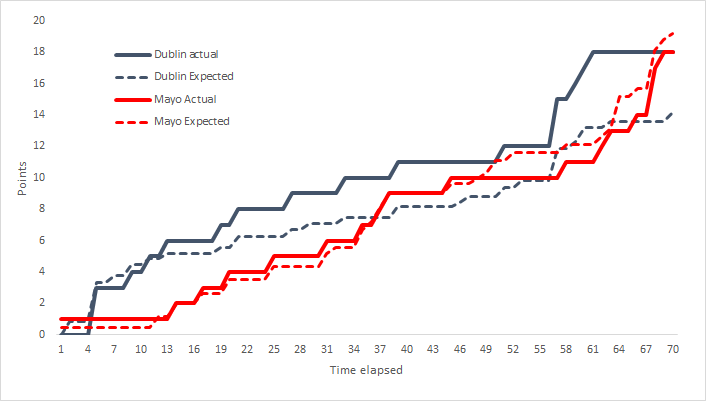 Taking shots when teams are ahead (red line) first you can see that apart from when team’s are 4 points up the returns are grouped relatively tightly together around the 49% average (I cannot give a reason for the drop at 4 points – we’ll just have to accept that it is random for now). 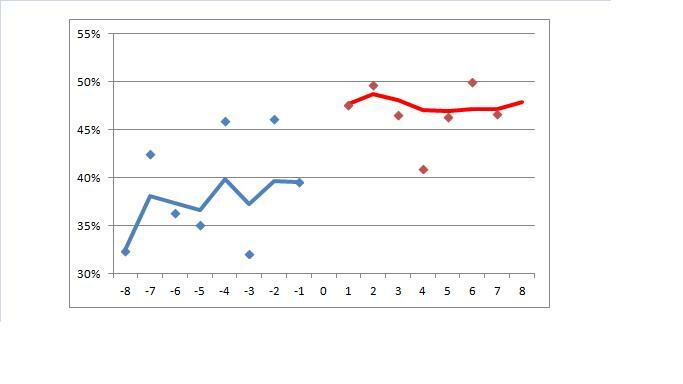 Shooting whilst chasing the lead (blue line) is altogether more volatile. Success rates for teams that are 2 or 4 points in arrears are quite high. One reason for this could be how teams defend. 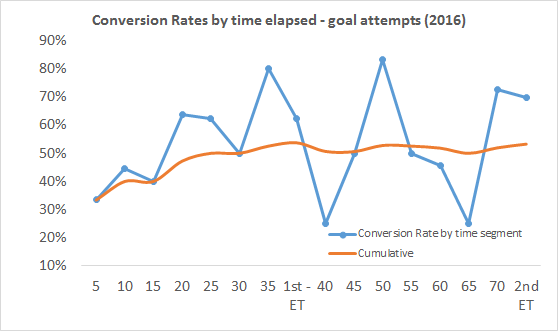 Teams drop back ‘protecting’ the goal offering up shots, with less pressure, from further out than they would normally as they know even if the opposition scores they still have a one score cushion. There may also be a mental cushion for the shooter – his is not the shot that “must” be made. 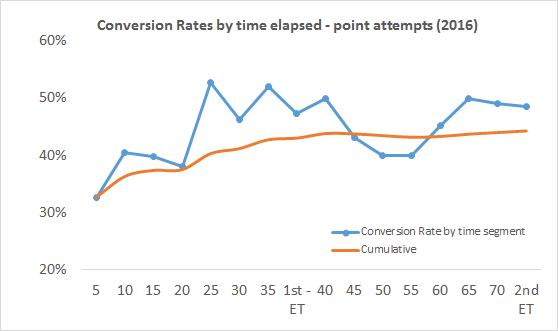 A similar dynamic could explain why it is that shots for those teams 3 points behind are significantly worse – with a less than optimal chance players might shoot for goal to draw level from positions where they would normally tap the ball over for a point. As described above the weighting is based primarily on a sectoral basis. 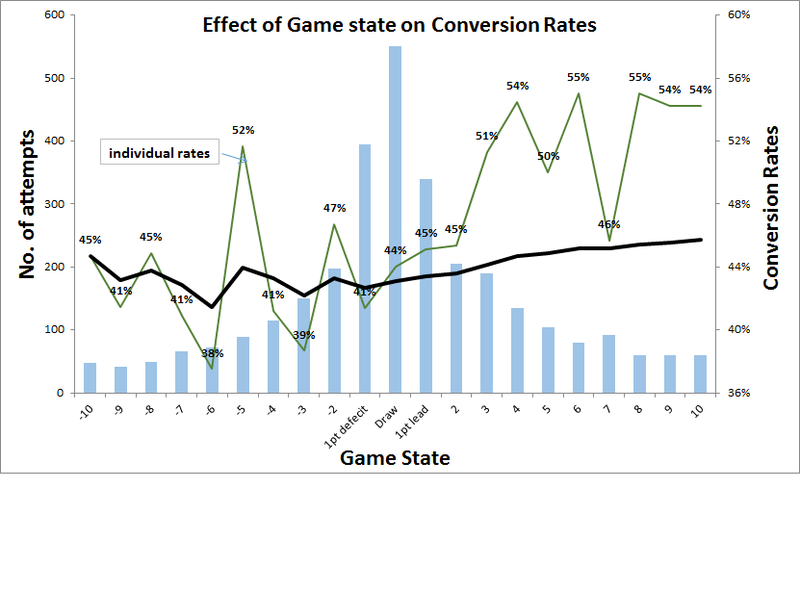 As such we have to ensure that there is a good spread (enough data points) across all the relevant sectors before making any major adjustment – and amending the weighting for game situation would be a major adjustment. We only have 867 shots from deadballs, which means that 4 of the 9 sectors have a volume of shots less than 100. I’m reluctant to make any changes to the weighting based on such a sparse spread. The spread for shots from play is much better. Firstly we have more shots (2,523) and secondly there are primarily only 6 sectors used. Sectors 1, 2 & 3 only account for 2.5% of shots. I would like to make adjustments within point groupings ( 1-3, 4- 6 etc.) however we just don’t have the volumes. As such for the 2013 Championship we’ll add game situation (behind, level, ahead) to the weighting for shots from play for Sectors 4 – 9.